100% natural red color makes me happy!!! 2. Put granulated sugar and water in a pot. When the sugar melts, stop the heat and soak the strawberries for 30 minutes. 3. When the syrup gets red, drain and separate the syrup and strawberries. 4. 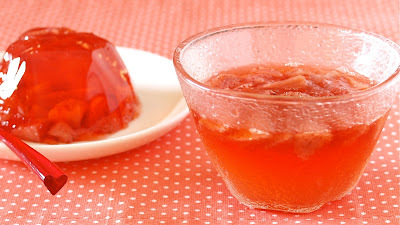 Heat the syrup in a microwave or in a pot (80C/176F), then mix in the gelatin powder. 5. Float the bottom of the bowl of the syrup in ice water to cool. When the syrup gets cold, add strawberries and mix well. 6. Serve in cups and cool in the fridge for about an hour to set.